Attached character loses an icon. 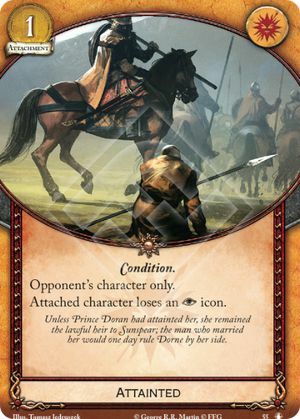 Unless Prince Doran had attainted her, she remained the lawful heir to Sunspear; the man who married her would one day rule Dorne by her side. The effects that grant an icon (e.g. Syrio's Training, Nymeria's second effect, Arya's ability) are all treated as adding "+1" icon. So if you had 0, you gain 1, you have 1. If you had 1 already, you gain 1, you're at 2 (which doesn't usually matter, most game things only check whether you have or do not have an icon). However, how this stacks with icon loss is where it matters. Icon loss is a -1. So if you have Arya (0 mil icon) with a dupe (+1 mil icon), who then gets her mil icon stolen by Nymeria (-1), and then Syrio grants her an icon with Syrio's ability (+1), you have a net 0+1-1+1=1 mil icon. If you have a Tyrion (0 mil icon) with a Syrio's training (+1 mil icon), and Caelotte takes away his mil icon (-1), he's back to having 0 mil icons.